ServiceBot is integrated with Stripe's payment processing platform to ensure the best fraud protection and seamless transactions possible for you and your customers. To begin selling your services through ServiceBot, you must first create an account with Stripe. Click here to create a Stripe account. Stripe's registration and activation process will request some information regarding your business. Ensure all relevant fields are properly filled. After you finish activating your account, navigate to your API keys on your Stripe dashboard (Developers -> API keys). If you do not want to use your live keys, toggle view test data. You should have a publishable API key and a secret API key. In your ServiceBot instance, navigate to Stripe Settings on the left sidebar (Settings -> Stripe Settings). Copy your publishable and secret keys and paste them into the appropriate fields under Reconfigure Stripe API Keys. Note: Live keys will have pk_live and sk_live instead of test. Lastly, you will need to add your ServiceBot webhook as an endpoint to your Stripe account. 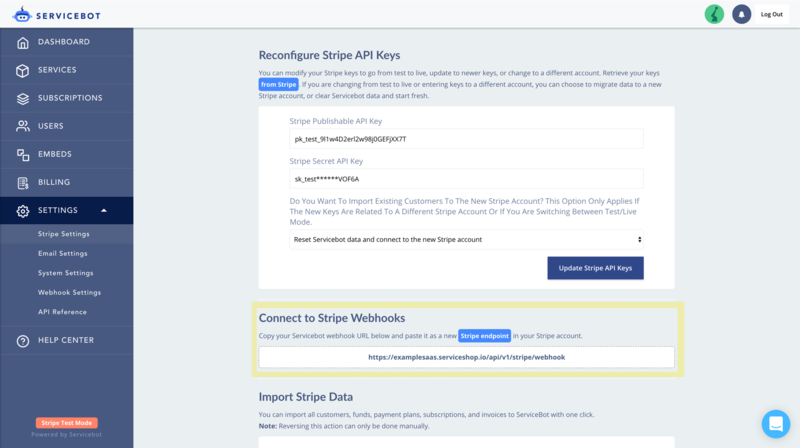 Just below where you pasted your API keys is a header that says Connect to Stripe Webhooks. ServiceBot will automatically generate a webhook URL for your own instance in the box below. Copy your own webhook URL and return to your Stripe dashboard. Under Webhooks (Developers -> Webhooks), click Add endpoint, and paste your URL into the field.